It's our monthly meet up this Sunday 9th September, and we will be having our annual ride to Wells, in memory of our friend and fellow club member Colin Birch, who sadly passed away a few years ago. I've got a great route planned out to get to Wells, which I'm confident you'll all enjoy! Weather this time of year can still be very good, so fingers crossed for a nice day! Great day today, but Apologies to all, for myself, Norm, and Clive, seemingly leaving you all behind shortly after leaving Wells on the way home, we stopped in a lay-by when we couldn’t see you, but Clive told us that you’d all turned left off the A37 towards the airport, I later found this to be incorrect and in fact someone had broken down! 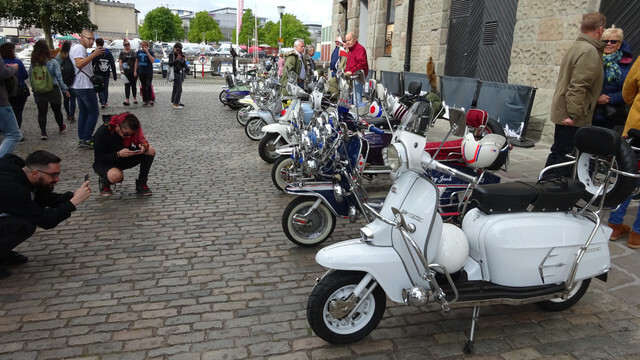 Yes it was a really good day out on the scoots today! Excellent turnout at The Arnolfini and the weather was pretty good as well! It was my scoot that broke down! Just a heat seizure after going up that long hill out of Wells! Nothing too serious, just a bit of a 'nip up'! Well done to Barry who was just behind me riding two up and managing to avoid colliding with my scoot, which was skidding from side to side! (Phew!) We let it cool down for a few mins and off we went again and took it nice and steady for the rest of the ride home! Many thanks to all who took part in our ride today! Hope you all had a good day out and all got home safely! Thanks Jim for a great day out - enjoyed the ride to Wells apart from the angry farmer who tried to take the whole club out with his trailer !! Relieved to hear your scoot recovered from its hot flush, and as you then had to negotiate Pensford hill it seems no worse for the nip-up. Nice one Jim. Another great day.